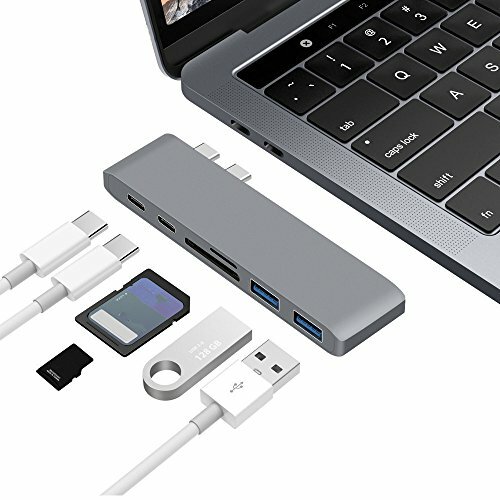 USB-C COMBO HUB 6 IN 1 MIYA LTD 6 in 1 USB C 3.1 Type C Hub Power Delivery High Speed USB 3.0 Combo Splitter Slim & compact Design SD/TF Card Reader With USB-C Charger PD for MacBook Pro 13" and 15"
★Thank you for taking the time to browsing or purchasing items from our store. We are always at your service if you have any concerns. Please give us some support if you satisfied with our products or services,which will encourage us to do better. ★For your convenience, please search "Miya Ltd + your product" to buy the fastest way to get other products you want, and have a clear view of other products we offer in the store. 【Slim & compact design】: making it easy to be carried to anywhere and saving desktop space,Plug and play, no any software or drivers needed and no need any complicated installation. 【Features one USB-C Thunderbolt 3 port】: which supports data transfer rate up to 40Gbps and video output up to 5K,Up to 5Gb/s transmission speed of the USB 3.0 ports, helping transmitting data fast. 【Unique design】:perfectly fits for MacBook Pro 13"/15",Allows you easily connect U-disk, keyboard, mouse, phone and other devices to MacBook Pro. Charging & transferring data simultaneously, you can charge your laptop while connect all supportable peripherals to transfer data.